Recently, I have been visiting urban farms as part of a research project. It’s been interesting to see that even a tiny piece of land can produce enough for sale. Last week I visited a home where a standard suburban backyard and front yard have been converted into a mini farm producing vegetables, herbs and seedlings. The owners grow enough to sell at two area farmers’ markets each week. This may be a trend. 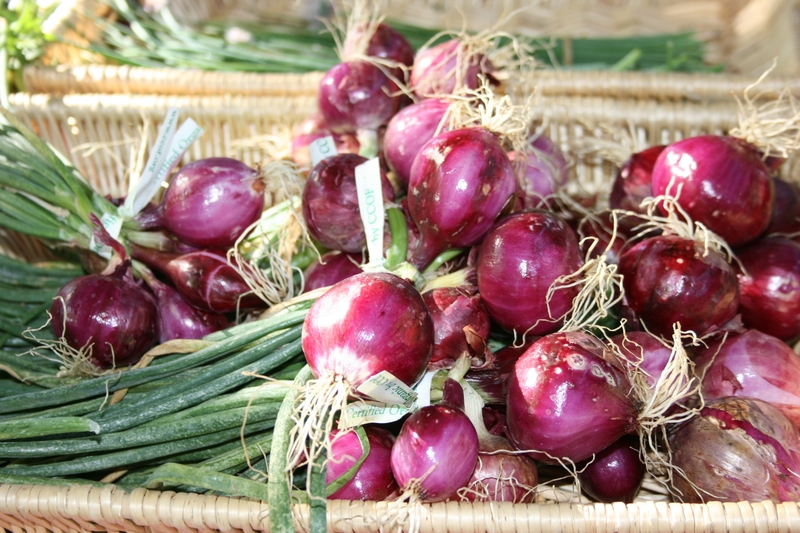 The Los Angeles County Agricultural Commissioner’s office certifies growers to sell at local farmers’ markets. According to the staff member I spoke with, they have received quite a few calls recently from LA County residents interested in selling at local markets. At a California Certified Farmers’ Market, everything has been grown on the farm and has been brought to the market by the farmer, their immediate family members, or their employees. An inspection and certification process helps to ensure the integrity of this system. In order to sell farm products grown in Los Angeles County at a Certified Farmers’ Market, growers must contact the Los Angeles County Agricultural Commissioner’s Office at 562-622-0426. (For those growing in other counties, they would contact their own county agricultural commissioner’s office). An inspector will make an appointment to visit the growing area to find out what and how much the farmer is growing, and how much they project they will have available for sale. There is a small annual fee for certification. After the inspection, and paying the fee, the farmer receives a Certified Producer’s Certificate to display when selling at a market. Growers can only sell what has been grown on the farm, and specifically, what is on the certificate. New crops can be added by amending the certificate. Becoming certified to sell at farmers’ markets is relatively simple, but the business of farming is not! Like starting any business, it requires careful research and planning before start-up. For example, farmers need to identify one or more farmers' markets that will be a good match for their operation, working with market managers. Also, many commercial farmers in Los Angeles, even very small growers, will need to join the LA Irrigated Lands Group to ensure compliance with water quality regulations. Many other issues need consideration as well. Some helpful on-line resources for starting a small farm business are available through the UC Small Farm Program. The best strategy is to do a considerable amount of homework before starting any urban farm venture where sales to the public are involved. A year or so ago, I met Judith Gerber, who like me has a special interest in the history of agriculture in Los Angeles. Judi, in addition to being one of our UC Master Gardener Volunteers, is a farm and garden writer and author of the recently released book, "Farming in Torrance and the South Bay". Judi and I are working together to document the agricultural history of Los Angeles County, once the largest farm county in the US, and now the largest urban county. We've been calling our project "From Cows to Concrete" and we will both be blogging about it periodically. Here is our first piece, on the transformation of the City of Los Angeles. This agricultural potential was realized as the area was settled several years later. In 1781, "El Pueblo de la Reina de los Angeles," was founded. Over the next several decades it grew into a small farming community, with both dry-land farming, and an irrigation system of ditches, or zanjas, that fed its wheat and maize. By 1790, Los Angeles produced more grain than most other California settlements, and by 1800, the harvest exceeded the pueblo’s local needs. By that same year, fruit orchards and vineyards were planted on a large scale. By the 1830s, there were over 100 acres of vineyard producing wine and brandy. The community became known for its grape production, and by 1851, about 1,000 gallons of wine were shipped from Los Angeles. The Gold Rush and the transcontinental railroads increased the demand for beef and other farm products, and sparked an influx of population into Los Angeles, further increasing demand. Los Angeles farmers responded by experimenting with other crops. A frontiersman and entrepreneur named William Wolfskill was the first to grow oranges commercially. The first commercial orange grove in the US was on a hill in what is now downtown Los Angeles, a forerunner of what was to become the massive Southern California citrus industry. Many people came from other parts of the country to try their hand at farming, and produced a diversity of commodities ranging from hay and grain to citrus and olives. The Los Angeles Chamber of Commerce even created a large department dedicated to attracting and advising new farmers. 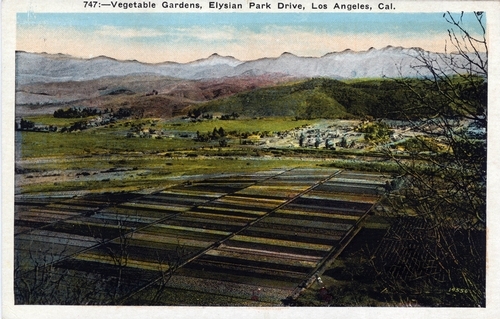 The opening of the Los Angeles aqueduct in 1913 allowed further intensification of farming to higher-value irrigated crops, especially in the San Fernando Valley as many of its communities became part of the city beginning in 1915. After World War II, suburbs and industry grew, squeezing out much of the city’s agricultural land, but farming was prominent in communities surrounding the city up until the 1960’s. Community gardens and urban agriculture have continued in the city, and have recently become more visible and popular, catalyzing the recent passage of the ‘Food and Flowers Freedom Act” allowing small-scale commercial production of fruit and flowers in residential neighborhoods. The city’s seal, created in 1905, contains oranges, grapes and olives, a reminder of our agricultural past, and a promise of future abundance. Our farm heritage has relevance today, as we work to create a Los Angeles with accessible, affordable, ample food for all its residents. I’m enjoying “Sending Flowers to America: Stories of the Los Angeles Flower Market and the People who Built an American Floral Industry”, by Peggi Ridgway and Jan Works. It tells the story of flower production in the Los Angeles area and the genesis of what is now the “largest wholesale flower district in the United States”. Residents of early Los Angeles found the climate of Los Angeles perfect for growing countless crops, including many kinds of flowers. According to the authors, “By 1890, the housewives of Southern California had firmly established themselves as the growers and sellers of cut flowers…these industrious women transformed their backyards into flower factories, harvesting calla lilies and other blooms for local florists and their homes” (p. 11). Advances in refrigeration and transportation eventually transformed flower growing from backyard enterprise to big business. By the second decade of the 20th Century, Southern California flowers were routinely shipped to other states. The flower business grew throughout the 1920 and 30s. Communities around Los Angeles County were known for their flower production, including Montebello, which was known as “the City of Flowers” and the South Bay/Torrance area. 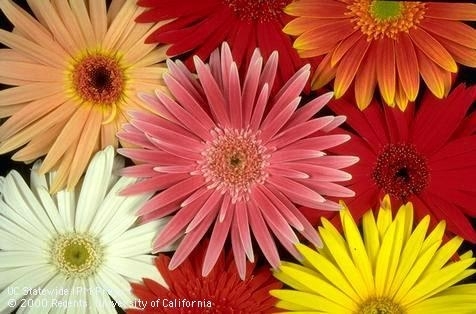 Los Angeles County farmers grew many kinds of flowers, including daisies, chrysanthemums, asters, carnations, callas, and gladiola. Many new immigrants were involved in flower production, including Greek, Italian and Japanese newcomers to Southern California. Japanese flower growers were especially influential, and they organized the Southern California Flower Market in 1913, in downtown Los Angeles’s wholesale district, relocating in 1923 to South Wall Street, where it continues to operate today. In 1924, another group, the American Florists’ Exchange, organized by European immigrants, opened the Los Angeles Flower Market across the street. Since then, the 700 block of South Wall Street has been the hub of the Los Angeles Flower Trade. See the Flower District’s website, at http://www.laflowerdistrict.com/index.asp for more information. The District markets are open to the public during certain hours. Commercial flower production in Los Angeles County began to fade away in the 1960’s and 1970’s, as most growers moved out to Orange County communities like Buena Park and Garden Grove, as well as to San Diego. Most flower farms were gone from LA County’s landscape by the 1980’s. (There is still significant production of some specialty flowers in those counties, especially San Diego, but today much of the market’s flowers are imported). It’s interesting that flower production in Los Angeles started as a backyard enterprise that allowed women to add to their household income. Hearkening back to these roots, backyard flower production in Los Angeles has recently received significant media attention. A local woman, Tara Kolla, was growing sweet peas, poppies, and other flowers to sell at a nearby farmers market. Her neighborhoods complained, and it turned out Kolla was violating an obscure zoning ordinance, passed in 1946, that allows residential production of vegetables for market, but not fruits, nuts or flowers. Kolla and other urban agriculture advocates have organized to change the zoning laws in Los Angeles to allow backyard production. Their proposed “Food and Flowers Freedom Act” is under consideration by the Los Angeles City Council. For more information about Kolla’s efforts, read this recent Sunset Magazine article: http://freshdirt.sunset.com/2009/10/legalizing-urban-farming-in-la-the-food-flowers-freedom-act.html . To learn more about the Food and Flowers Freedom Act, see http://urbanfarmingadvocates.org/?p=22 . The highlight of my week was visiting Farm Advisor Andre Biscaro at our Antelope Valley office in Lancaster. I went with Andre to visit one of his field trials. He is testing numerous varieties of alfalfa to see what works best in the hot, windy high desert. Alfalfa has historically been an important crop in Los Angeles County. A 1940 Los Angeles Chamber of Commerce publication referred to alfalfa as "Green Gold", because it was considered very profitable, and listed the Antelope Valley, along with the San Fernando and San Gabriel Valleys as important production areas. Alfalfa was traditionally grown to feed cows at the hundreds of dairies that existed in Los Angeles County. Those dairies have closed or left over the years. In fact, Andre's variety trial is on the property of what I believe is LA County's last commercial dairy. 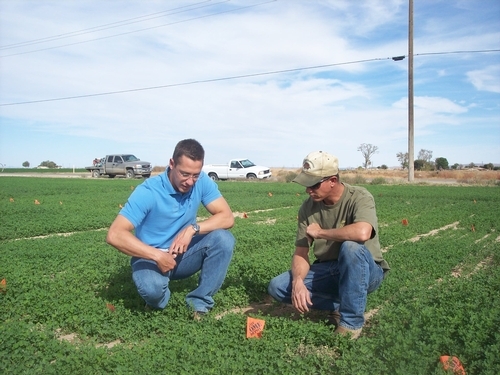 Farmer Nick Van Dam provided Andre with the space for his alfalfa variety trial, on land that had previously been used to grow onions, another important crop in the Antelope Valley. The dairies are gone for the most part, but alfalfa is still an important crop in LA County, although it's no longer grown commercially anywhere in the county other than the Antelope Valley. According to the most recent LA County Crop Report (2007), there were 5,804 acres of alfalfa hay grown, valued at over nine million dollars. This is an interesting contrast to the 1940 LA Chamber Report which stated that 46,000 acres were grown that year, valued at $287,500. I often see and find inspiration in the links between current events around Los Angeles and our county's agricultural heritage. This week my "ahah" moment came at the Compton Creek Symposium, an event put on jointly by my organization, UC Cooperative Extension, and the Los Angeles and San Gabriel Rivers Watershed Council. This was a two-day event that brought together community, staff of government agencies, city officials and local non-profits to discuss the Compton Creek watershed and its renovation. One symposium presenter, Reginald Fagan, talked about what Compton was like when he was a boy. He grew up playing alongside the creek, collecting shellfish and crayfish, and riding his bike and ponies along its bank. He was a member of the 4-H Bison Club active in Compton at that time. "When I was growing up here we all had gardens. Food wasn't an issue", said Fagan. Another participant at the symposium told me about growing up in Compton in the late 1950's. "This was the country. There were dairies everywhere". A piece of Compton's farm history is alive today in the community of Richland Farms, a neighborhood of approximately 400 homes, many on an acre or more of land, where residents own horses and livestock. In fact, I discovered that there is a very active youth equestrian group based in Richland Farms called the Compton Jr. Posse. I had a great time talking with their founder and Executive Director, Mayisha Akbar. Learn about this impressive organization at http://www.comptonjrposse.org/ . During the two-day symposium, as participants shared their visions for the future of Compton and its Creek, urban agriculture and gardening were mentioned numerous times as viable components of that future. For example, Reginald Fagan is currently working to develop an agricultural resource center for Compton, The Timbuktu Resource Center and Learning Academy, which will engage local youth in sustainable agriculture. Others talked about creating a community garden near the creek. In fact, the approved regional plan for the area is entitled the "Compton Creek Regional Garden Park Master Plan". The plan includes native plants and trees, pocket parks, a community garden, and even a hitching post and watering trough for horses, along with many other features to enhance the area. To learn more about Compton Creek, go to The Watershed Council website at http://lasgrwc2.org/programsandprojects/llarc.aspx?search=comptoncreek. A copy of the Compton Creek Regional Garden Park Master Plan, which includes history, photos, community input, maps and much more, can be downloaded at the Council's on-line document library at http://lasgrwc2.org/dataandreference/Document.aspx. 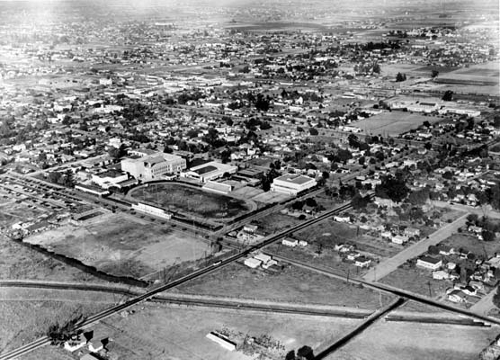 Aerial view of Compton, circa 1936. Compton Creek is in the foreground.